Cowley College’s creative writing program hosted a Writers’ Corner on Thursday, February 9. 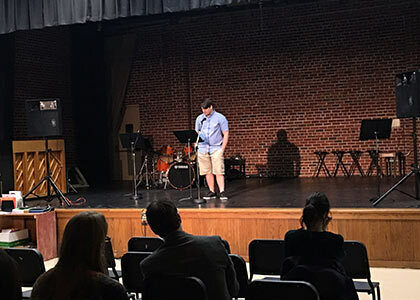 The audience was entertained with 22 original works by nine writers, including special guests Vice President of Academic Affairs Dr. Harold Arnett, Ponca City High School student Isaac Cervantes, and Marlys Cervantes, Humanities Department Chair and director of the Creative Writing program at the college. Cowley’s writing program offers classes such as Creative Writing, Poetry Writing, Fiction Writing, Journal Writing/Storytelling, Screenwriting, and more. The program also publishes an online literary and art journal, Mile Marker Review, giving students the additional experiences that come with planning, writing, and editing for a publication. Cervantes would like to invite all high school students interested in writing to attend the upcoming Arts and Humanities Day on February 22. Registration is online at http://www.cowley.edu/artshuman/, and there are prizes awarded. If you have questions about the event or program, contact Cervantes at marlys.cervantes@cowley.edu. Creative Claws, Cowley’s writing club, will host a talent show on March 9, and the program’s next Writers’ Corner will be April 27.